Butte Valley is a beautifully-secluded spot in the southwest corner of Death Valley National Park. It descends in elevation from about 4,500 feet on its west edge to around 3,800 feet on the eastern side. From near the middle of its brush-covered floor rises the geologic phenomenon that inspired the area's name--a peak distinguished by striated bands of deep browns, yellow, orange, blue, and gray that rises to an elevation of about 4,740 feet. Several canyons pierce the mountain ranges that surround the valley on all sides, while a variety of dirt roads radiate from near Anvil Spring, a small oasis toward the southern end of the valley, leading to various abandoned mines in the area. 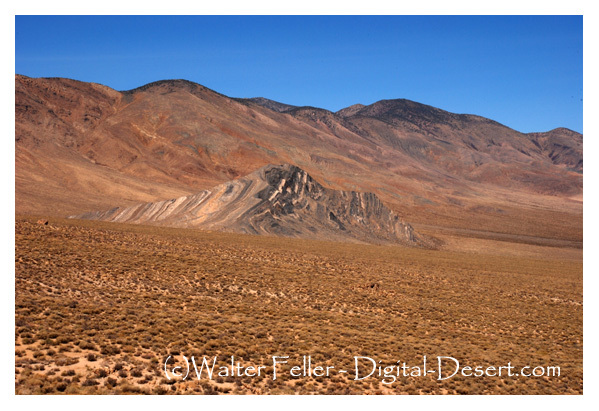 Access to the valley is gained either from Death Valley to the east or from Panamint Valley to the west. Entrance is probably easiest via Warm Spring Canyon. 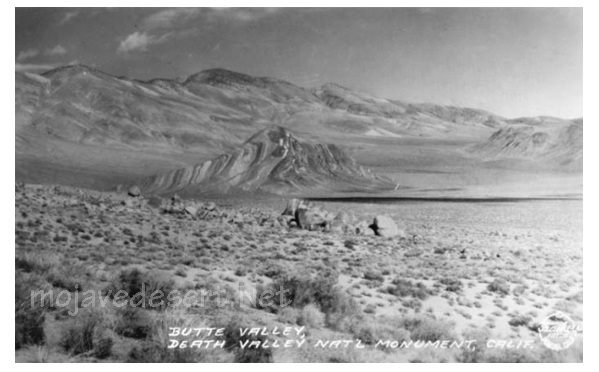 The geology of the Butte Valley, Southern Central Death Valley regional field guide. Backroad to Butte Valley via Warm Springs Canyon in Death Valley National Park.